Dawn’s light and shadow found me hunting for the place I remembered — one of wonder and inspiration—UCSC’s Student Garden. As an apprentice there I received a different kind of education, a corollary experience to my enrolled courses. Both educational experiences merged helping me form the foundation of my adult core values, personally and professionally. Little did I know or suspect back then that such a profound shift would occur. The deeper undergraduate educational experience lured me to transfer from UC Davis to UC Santa Cruz–a learning environment that offered small lecture hall classes and seminars with full professors. Its method taught us to ask questions and then find answers or at least possibilities. A very different experience from Davis’ immense lecture halls with profs at a distance and TA’s staffing the discussion groups. Santa Cruz classes’ extensive reading lists and numerous papers seemed to ask more of me than the multiple choice/short essay tests at Davis. Dr. Paul Lee’s class–the subject long forgotten—unintentionally introduced me to the environmental movement and the campus’ Student Garden Project. He had managed to coax Alan Chadwick from England to lead it. I don’t remember what got me there. Was it the sunrise service on Easter morning that Dr. Lee (also a minister) held there? I do remember the impression of my first visit—paradise. In the garden’s center stood a building called the Chalet. Fragrant roses climbed its pergola and doves cooed in dovecots nearby. The most remarkable food appeared for celebrations and lunch. “Organic” food was unknown and unheard of at the time. I’d never tasted it, nor had I tasted goat milk or goat cheese, or grains other than white rice. The sensory experiences of the hillside garden–the flower’s fragrance, the food’s taste, the building’s tactile wood framing, pergola and benches, the bird song, and Chadwick’s amazing lectures that stimulated my brain–created a spiritual experience of place unlike any I had known in a cultivated landscape. It reminded me of the wonder and awe evoked by the wilderness of Yosemite, Muir Woods, and northern California’s redwood forests. Somehow I apprenticed to Alan Chadwick in the Student Garden Project the end of my junior year. That translated in my senior year to juggling a heavy course load of four classes of reading lists and papers and the work at the garden. Waking before dawn I would arrive about sunrise. My first task was to hand pick banana slugs! Now if you’ve never seen a banana slug–you’re in for a surprise. Huge! Yellow slugs aptly named that I’d often seen on paths on the way to classes. Never did I dream that I would be picking them BAREHANDED. The first day I wasn’t too happy about the slimy prospect gathering them from the raised beds to fill my bucket. Neither was anyone else. Little did I know I had a delightful experience in store. With a full bucket in hand we were led to a pen of baby ducks and asked to feed them. It was a sight to behold. The ducks positively LOVED the slugs. The pens radiated duckling rapture and joy. Like Pavlov’s dog, I was hooked to slug gathering so I could feed those ducks and experience their joy! Less joyful, but educational never-the-less, tasks included double digging bed rows, collecting food trash from the dorms to compost, harvesting baby vegetables to thin the crop, and building the small stone wall off the main road entrance into campus at the foot of the garden. Delights included the meals–breakfast or lunch –at the chalet. The distinctive flavor of the food harvested from the garden altered my expectations forever. For example, cucumbers and celery presented intense flavors so very different from the bland vegetable found at the supermarket. Other delights included Chadwick’s spell binding lectures. As an accomplished Shakespearean actor the faculty was glad to have his performances in the bard’s plays in that wooden theatre down by the old farm. The memorable productions were intimate, dynamic, and powerful because one could actually understand the dialog and get the jokes or nuances of the drama. Imagine horticultural lectures spoken by an English actor. Whether Chadwick talked of pruning or soil building or double digging, his poetic presentations were from the perspective of the plants’ needs as opposed man’s needs. It was a new way of thinking for me. I found him formidable and scary. He didn’t like machines so this tall, tan, wiry man rode his bicycle up the incredibly steep hill seemingly effortlessly from somewhere in town every day. He seemed ageless but we calculated that he might be 60 or 70 at time. He didn’t like people and scowled at everyone. A man of few words he spoke only to a chosen few. Others like me asked them questions. 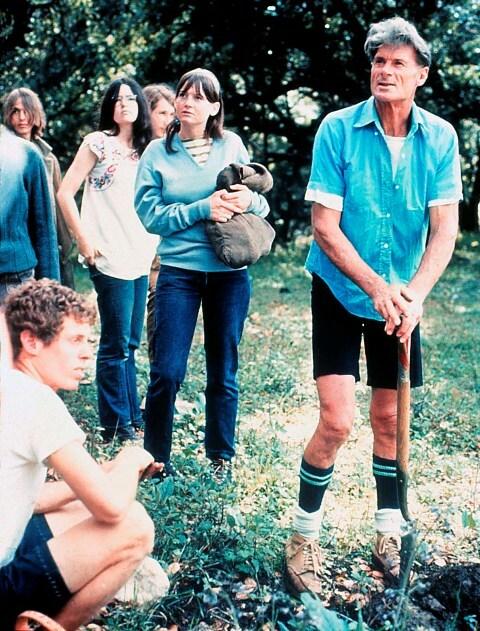 The young man crouching to the left of Chadwick in the photo above was one of his core group. I’m in the photo–unbelievable– as I got this random photo from my contact at the alumni office (Thank you Sandra Gresham of the CFRE Director of Development, Regional Programs at UC Santa Cruz). I’m the one with the head partly visible between the two girls. There I am, standing in a furrow, but at a respectable distance from Chadwick. I needed images of the garden for my lecture “A Ecological Garden Maker’s Roots and Design Work”. Googling Alan Chadwick I was surprised to find my mentor listed as one of seven in the Ecology Hall of Fame. His photo is surrounded by the likes of Rachel Carson, Henry Thoreau, John Muir, Aldo Leopold, and John Burroughs. 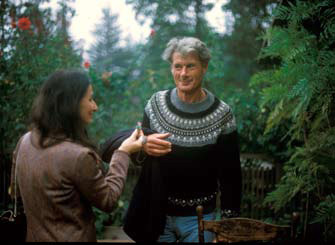 I had heard that the Student Farm (the planning stages were in the works while I was there) and later a garden near Willits, CA, that Alan was involved in had catalyzed the organic farm movement, but I never dreamed he would be listed as such. The sensual experience of the Student Garden and the organic gardening techniques learned there has served me well. I’ve grown organic food wherever I‘ve lived–in containers or in the ground. I made compost and double dug my gardens. Without ducks, I use other organic methods to avoid pests. Professionally the principles I learned formed the foundation for my landscape design practice. As an ecological garden maker I use the organic practice of soil building and its prescription “feed the soil–it will feed the plant”. The maintenance guidelines supplied to my clients are based on organic principles of soil building, composting, and no herbicides or pesticides use. The attitude of “what do plants need” and “what do people need” grounds my thinking, study, and professional practice. Today, at the Santa Cruz campus, you wouldn’t know that the start of something so important–the organic farm movement–began there. Two years ago I went looking for it when on campus representing the “B-Slugs”, the Boston Alumni Group. I found the garden because I remembered where it was. Visitor parking nearby would help. As it was daybreak on a Saturday morning, I could park on the shoulder of the entry road to Merrill College and look for the garden’s entrance. The original one is gone. A visitor’s first view entering the road lined with wheel barrows and porta-potties is a tall electric wire security fence around temporary buildings. You wonder what is in there! Once you find the gate, you discover that the chalet is still there but the dovecots are gone. Hillside garden rows still hold the promise of harvest and the spirit of the place seemed vital. The garden, a treasure, needs a bit of sprucing up and recognition. To my mind its impact on our current culture is as important as the work in astrophysics at the campus today. Perhaps a bronze sculpture of Chadwick and a bit of the history on a well-designed National Park- like sign would do well. I think UC Santa Cruz should celebrate the garden with more than a name change. It’s now called the Chadwick Garden.